Tom Hoogendoorn, his brother and families own Valedoorn Farms in Agassiz (just north-west of Chilliwack), British Columbia. Together they raise and care for 300 dairy cows, including 5; Daffodil, Jasmine, Rianne, Hester and Skylar; who will serve as the final judges in the BC Dairy Association’s Music Makes More Milk song competition. Studies have shown that if cows like the music (classical in particular) being played in the barn, it may result in the production of more milk. 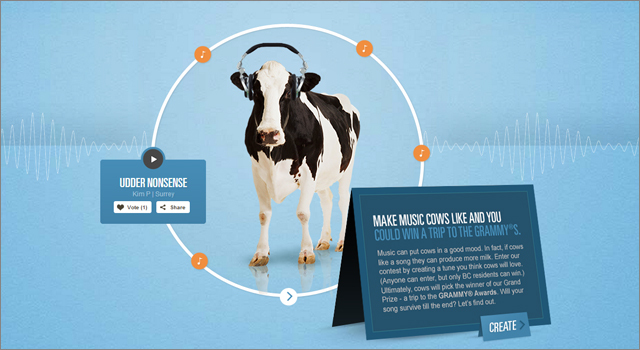 Your mission is to create a song, using the online music composition application on the contest website, that the cows on Valdedoorn Farms will enjoy. The top 15 songs will be voted on by the public until November 16, with the most popular tunes being played to the cows. A special ‘cow-cam’ will be available to watch the reactions of the bovine jury. In the final round, one finalist’s song will be played each day before milking. The amount of milk produced each day will be measured, with the song that resulted in the most milk being declared the overall winner. The Music Makes More Milk competition was created by the Vancouver office of DDB Canada.